Who needs instruments when you have an iPhone, right? While windscreen mounts have long allowed car drivers to use their smartphones as driving displays, attempting the same on a motorcycle has generally been considered folly. 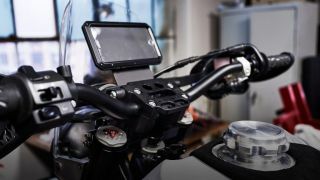 But a new concept bike from Dutch company Revit actually puts the phone front and centre, using an iPhone as a mounted instrument display for its Revit #95 bike. Based on KTM's 950 Super Enduro motorcycle, the Revit #95 completely replaces traditional instruments, instead including a specially mounted bracket for your iPhone, which can display your key information in real time using a number of "dash" apps. Being a concept bike, there are a few other high-tech developments, like an all-aluminium gas tank and the inclusion of a Christini All Wheel Drive system, which allows the bike to shift power to the front wheel should the rear tyre lose 80 percent traction or more. Given the iPhone's many apps and on board navigation, it was only going to be a matter of time before someone attached it to a motorcycle. That said, while an iPhone display looks cool, it's doubtful that motorcycle manufacturers will be rushing to follow this trend just yet.